Mike here. I’ve been asked by some of our newsletter subscribers to dig out an article from the July 2015 issue. Dave Fenton who some of you might know from MegaPoints Controllers wrote an article on adding servo control to Dapol semaphore signals including the bounce. If you want to see it working see below or visit our exhibition on the 11th and 12th March 2017. So without further a do; over to Dave. I recently acquired a pair of broken N gauge Dapol semaphore signals and thought they would make for an easy upgrade to add some realistic semaphore bounce. The standard mechanism is incapable of bounce and had failed with differing symptoms on both units. Undeterred at the small size of N gauge and my big fat hands, I acquired some HK- 5330 Ultra-Micro Digital Servos from HobbyKing. At just over 1 cm long and about 6mm wide, I thought they would make an excellent replacement drive unit. These have the added benefit of not twitching when power is applied thereby preventing any over stressing of the tiny linkages at power on time. 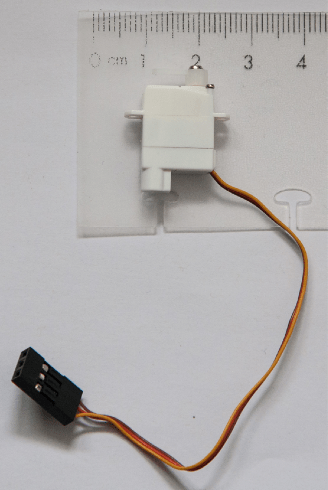 Fitting a servo means that you loose the simplicity of a 14mm mounting the Dapol unit affords as it will need modifying to a rectangular hole so the servo can be navigated through the baseboard. I ended up cutting a hole 24mm x 17mm which would allow the new servo assembly to pass through unobstructed. Work began by removing the lower screw at the base of the thread and splitting the motor housing. The circuit board was carefully prized out of one half and the wires to the built in LED cut leaving the longest possible length. On one unit the piano wire remained in place and was held under tension with a built in spring and capped with a plastic collet. The second unit had a different arrangement with the collet on the opposite side of the spring. It appears the design had altered between the manufacture of the two units making installation slightly different for each. Undeterred, I proceeded to cut the piano wire on the latter unit leaving enough room to solder a new piece to it when ready. I decided that on the first unit all I needed to do was position the servo with a cut down arm acting as a cam on the base of the spring retaining collet. 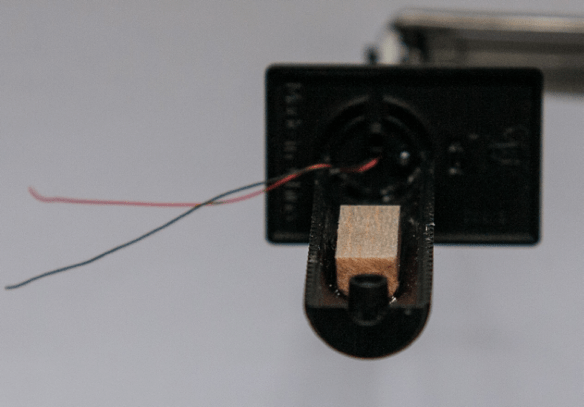 The second unit was going to have its own piano wire bent into shape and soldered to the remaining wire connected to the back of the semaphore arm. Before installing any of the servos I glued in place a small square piece of balsa wood to make a base to attach the servo to. After it had set I sliced the top of the balsa to form a level surface with the opposing sides of the threaded shell half. The servos were positioned in place and a couple of drops of super glue used to secure them into position. The second servo had the additional piano wire attached before fitting to help with its placement. As I had previously set the servo arms to their mid point with a MegaPoints Controller I only had to ensure the semaphore arms were in the middle of their travel before the glue set. This was to make final adjustment easy. The second semaphore had the two piano wires soldered together.